Heat oil in a pan, add shallots,garlic, peanut ,Red chilles & saute few mins. Grind well with tamarind & salt. For tempering, heat oil in a pan add mustard seed, urad dhal ,Curry leaves & add to the chutney. Serve withDosa or idly or roti. Adding shallots/onion is new to me sri..will try it next time...Yummy chutney..
Hai srikar chutney looks yummy.I know it tastes good.Saturday only i prepare ravva dosa and peanut chutey.Its very nice. I have seen peanut chutney being posted often but I have never prepared any so far. Will book mark your page and try it some time. nice recipe for peanut chutney.. frying onions, garlic is new to me. i usually make peanut chutney like coconut chutney. this one sounds good. This chutney is new to me. It looks sooo... yummy ,I will try it soon :). I also add fried onions to the peanut chutney sometimes which adds to the taste...Next time i will add garlic as well. Adding onions is new to me,i use peanuts,tamarind and red chillies. 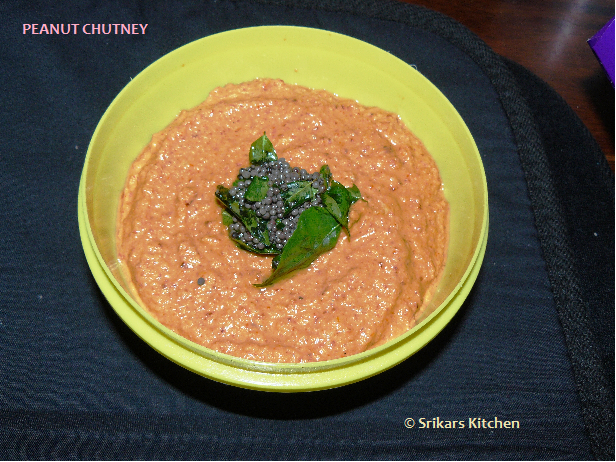 My version of peanut chutney is completely different from urs, will try urs soon! looks delicious! I love peanut chutney too, great with idlis and dosais, yummm! Even me do this like coconut chutney...This is absolutely new tome...Nice..Am sure, will taste very different.. Such a tempting delicious chutney. Yummy chutney! Hot and spicy! Peanut chutney looks creamy and yummmm..I like your version of adding onions..thanks! Idly and this chutney...just enough for me...love it. I like my amma preparation a lot. Ur version looks delicious. adding shallots to peanut chutney is new to me. Good one. Yummy.